As a program, Interdisciplinary Health relies on discipline-specific resources in such fields as Education, Indigenous Studies, Human Kinetics, Nursing, Psychology and Sociology. Laurentian's graduate program in Interdisciplinary Health integrates knowledge from various health fields including Psychology, Sociology, Human Kinetics and related disciplines to provide a broad understanding of health and human development over the life course. Originally a Master's in Human Development, the program was renamed in September 2014. For more information on the program, please visit its website. The purpose of this guide is to recommend print and electronic resources for conducting research into Interdisciplinary Health in the Library. Note: Library databases marked with a (which describes the database) open in the same window as this guide. Upon completion of a search in such a database, to return to the guide, you must click the back arrrow on your browser; alternatively, most browsers give you the option of opening these databases in a new tab or a new window. The Canadian Nurses Association believes: "Evidence-informed decision-making is a continuous interactive process involving the explicit, conscientious and judicious consideration of the best available evidence to provide care." However, the Association concludes: "It is imperative to acknowledge that no level of evidence eliminates the need for professional clinical judgment or for the consideration of client preferences. According to Nurse-One: "Patients depend on [health professionals] to do the best on their behalf. As part of their professional accountability, [health professionals] must continually examine the best way to deliver care...When delivered in a context of caring and an organizational culture that promotes best practices, EBP is associated with higher quality care and better patient outcomes than care that is steeped in tradition." Further "EBP also reduces practice variations, promoting greater consistency of care and contributing greatly to quality and patient safety agendas... EBP leads to improved health care provider satisfaction... including increased... autonomy...Work stress is reduced for[hea;th professinmals] when evidence-based guidelines are enacted.... At a system level, “health-care services based on the best currently available evidence have been shown to decrease costs” and improve cost-effectiveness." A variety of sources are being used by health professionals to facilitate their use of evidence. These sources include systematic reviews, research studies and abstraction journals that summarize valid, clinically useful published studies, and clinical practice guidelines. Guidelines are based on the most rigorous research available, and when research is not available, they are grounded in expert opinion and consensus." A piece of evidence's ability to guide clinical action increases as you move up the pyramid. The breadth of knowledge is largest at the base of the triangle. N.B. This and the following panel of this Guide has been adapted from one developed at McMaster University. It has been modified for local use. DiCenso, A., Bayley, L., & Haynes, R. B. (2009). Accessing pre-appraised evidence: fine-tuning the 5S model into a 6S model. Evidence based nursing, 12(4), 99-101. Robeson, P., Dobbins, M., DeCorby, K., & Tirilis, D. (2010). Facilitating access to pre-processed research evidence in public health. BMC public health, 10(1), 95. Windish, D. (2013). Searching for the right evidence: how to answer your clinical questions using the 6S hierarchy. Evidence Based Medicine, 18(3), 93-97. Integrating information from the lower levels of the hierarchy with individual patient records, systems represent the ideal source of evidence for clinical decision-making. Summaries are regularly updated clinical guidelines or textbooks that integrate evidence-based information about specific clinical problems. A list of links to Evidence-Informed Practice is available from from the OAPAN Canadian Center of Excellence. Up to Date (Used by a variety of health professionals). 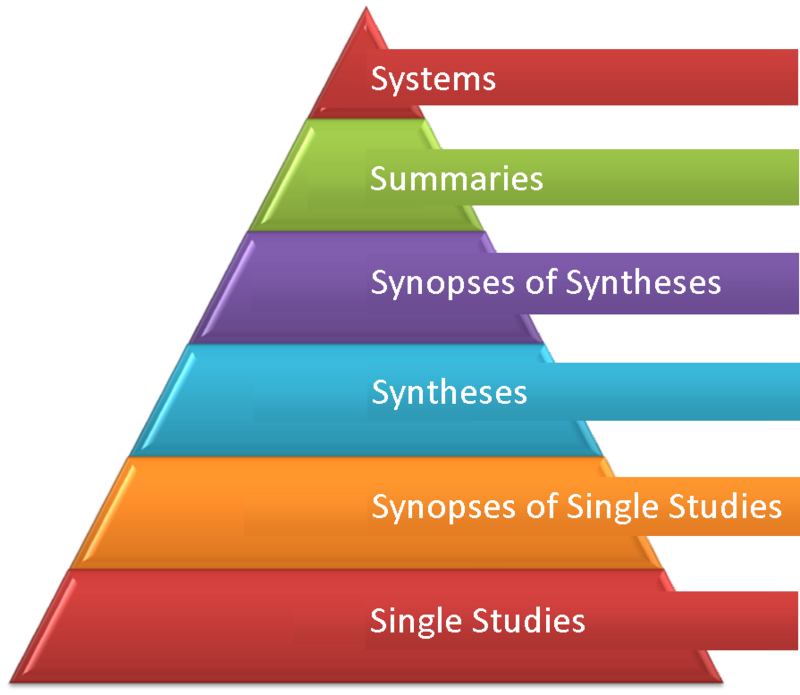 Synopses of syntheses, summarize the information found in systematic reviews. By drawing conclusions from evidence at lower levels of the pyramid, these synopses often provide sufficient information to support clinical action. Commonly referred to as a systematic review, a synthesis is a comprehensive summary of all the evidence surrounding a specific research question. Studies represent unique research conducted to answer specific clincial questions. Need a Film not Available in Laurentian's Online Film Collections? At Laurentian, professors will specify the citation style to be used. In the Interdisciplinary Health program, it is normally APA. To learn more about the APA and other citation styles, consult Laurentian's guide to citation styles.